I've been reading all I can about our new RV, trying to prepare myself for the learning curve of this vs. our little Hybrid TT. I am getting mixed reviews about the on demand water heater, and I think I can live with it...we'll see. I love a strong shower, so if the only way to keep the water up to temp is to lower the flow, I may be disappointed. My real question is...where is the thermostat to control the temperature of the WH? Inside the camper or out behind the door to the WH? I don't remember seeing it when we were in the camper. Where the control is depends on whether you have a Girard Gen 2 or Gen 3 model. If your coach is new enough, you'll get the Gen 3. That will have a digital control mounted somewhere near the bathroom. It might look like a thermostat. If you get a Gen 2, then the control is a dial (like a rheostat) in the bathroom. Turn it clockwise, toward "red" to make things hotter. We've had two RVs and neither has had a strong shower by any sense of the word. 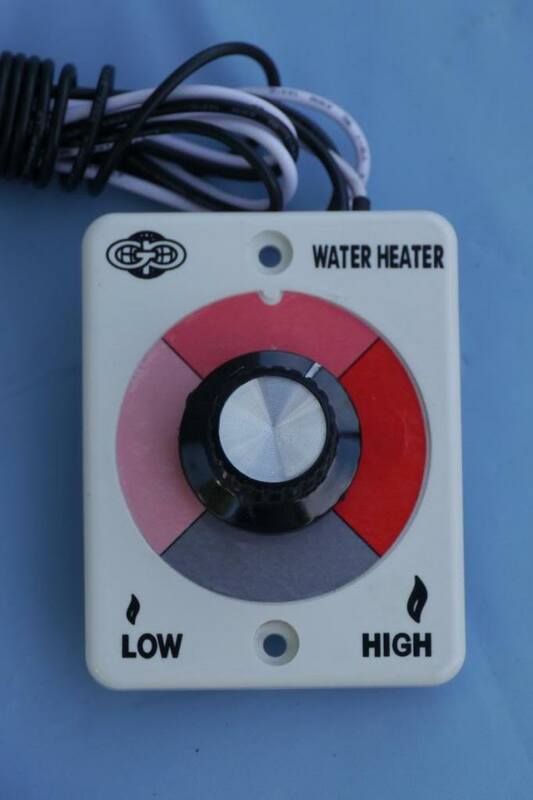 The one time we had great flow -- we were hooked up to camground water (aka "City Fixtures") but, as I've posted, the Girard couldn't heat the water properly. I love a strong shower, so if the only way to keep the water up to temp is to lower the flow, I may be disappointed. So do we. Since we camp seasonally at sites that have full hookups AND at least 40# of pressure, we set our Girard at 120 degrees and NEVER change it. We also replaced the factory shower head with an Oxygenics and took out the flow restrictor to maximize flow thru the system, which actually gives us a "stronger" shower than we have at home! We also have hot enough water for dishes AND showers and add as much cold water in as needed to adjust the temp to our liking. If you regularly camp at sites that don't have decent water pressure, or are boondocking where water conservation is paramount, then the consensus is that you won't be a "happy camper" and might have to resort to tricks like you mentioned to get the type of shower you want. Like was mentioned before, they usually place the control panel in the bathroom. If it is the newest model (Gen 3), it will look like this. In our 2016 31FK the thermostat is located right inside the door to the coach, near the control center/generator controls. We camp without hookups mostly and it took a little bit to figure out a procedure for showering to not waste a bunch of water, but we don't have any big issues. It does work phenomenally when you have full hook ups. Great advice about the Oxygenics shower head! It's on my to-do list too!